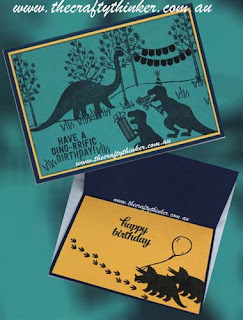 The Crafty Thinker: Stephanie Fischer - Independent Stampin' Up Demonstrator: No Bones About It - Dinoparty! If you saw my previous post featuring dinosaurs, you may be wondering .... what happened next? 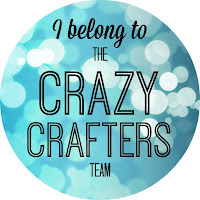 Even if you aren't wondering - I'm going to tell you now! On the front of the card, the T-rex couple are arriving at the party, bearing their gifts, while the brachiosaurus puts the finishing touches to the bunting in the trees (who better to reach high enough?). 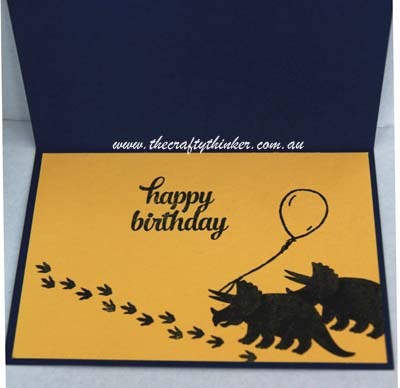 Inside the card, we find our two Triceratops friends. They haven't quite made it to the party yet, but they're close and they're bringing a balloon as their contribution to the festivities! 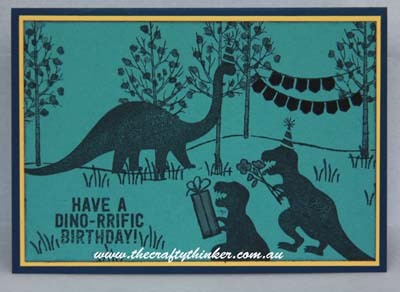 The card is Night of Navy with layers of Daffodil Delight and Lost Lagoon (doesn't that just sound like an inviting name for a dinosaur?!). I have used black ink everywhere. The only exception is the Smoky Slate marker I used to fill in the flowers, tree trunks and parcel. I also used a Basic Black marker on the bunting to hide the "Merry Christmas" wording! Can you pick all the stamp sets I combined in these little scenes?